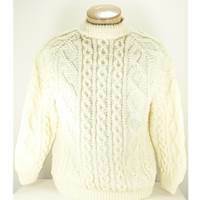 This is a Celtic Triple Cable Stitch Wool Pull Over Sweater. This sweater features Aran traditional patterns. The cable stitch is said to be the fisherman's rope safety and good luck when fishing. Each Rita Condron Brand hand knit sweater comes with a keepsake tag hand signed by the knitter. 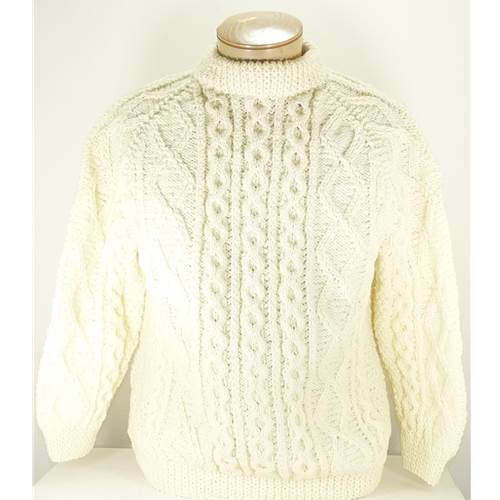 This Authentic Irish Hand Knit sweater was hand knit by Ann Belton. These sweaters are made with traditional quality and care in Ireland. It is made of 100% Pure Wool / 100% Laine Natural.